We have a full range of tires from reputable brands such as Goodyear, Firestone and Bridgestone. From brake repair, engine tune ups and oil changes to complete maintenance, we do it all. If you want answers to common questions about auto repair and maintenance or tires, then read our FAQs. 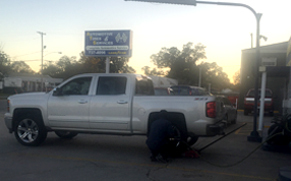 If you are looking for complete auto repair and maintenance services at competitive prices, then Automotive Tires and Services LLC is your one-stop shop in Harahan, LA. We are a family owned, local auto repair shop offering automotive repair, maintenance and tire services. We are licensed and highly skilled to ensure that our clients’ vehicles are returned to them in top condition. We are also a registered dealer for many tire brands such as Goodyear and Bridgestone. Customer satisfaction is our first priority and our prices are unmatched in the entire service area. We offer free estimates and maintain service records of everything we have done for our clients’ convenience. Our company also offers a 5% discount to military personnel, veterans and senior citizens! Our company handles all kinds of car maintenance and repair. Let us know if you need one time repair or regular maintenance service. Call us for a free estimate.